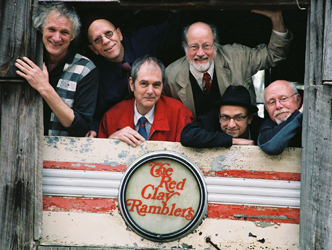 The Red Clay Ramblers are a fun bunch. “Though they’re a walking encyclopedia of Americana,” says the Greensboro News & Record, they “never forget they're up there to entertain.” And entertain they do, with a repertoire that includes bluegrass, blues, folk, and gospel, and a healthy dose of homespun wit and charm. The band features Jack Herrick on bass, trumpet, guitar, bouzouki, and whistles, Clay Buckner on fiddle, mandolin, and harmonica, Chris Frank on accordion, guitar, tuba, ukelele, and trombone, and Bland Simpson on piano. They all sing – and they all talk! They tell funny stories and mix their music with just the right amount of mayhem and magic. The Nashville Tennessean calls them “acoustic music greats.” Their “music making is perfection,” opines the New York Times. “Irresistible,” says New York Newsday.